I don’t remember specifically when I first discovered Steve Reich’s ‘New York Counterpoint’ but it has been one of the most influential pieces of music for me during my time at MCM and for my clarinet playing in general. It was this piece that I sat and listened to over and over, discovering minimalism and thinking about how exciting it would be to perform this piece at some stage during my degree. I also felt that it would be a worthwhile technical exercise as a clarinettist to create my own tape of NYC by overdubbing all the parts. When I found a copy of the score and live part online earlier this year I jumped on it and ordered it without hesitation. One week later It arrived and I was hooked. I decided then, come midyear break, I would make it my project to record NYC for my recital at the end of the year. Well, that didn’t go exactly to plan. Its already the end of the break and we’ve only just started. But, never to mind, the important part is that NYC is now taking shape and I’m documenting it all of the way through until complete. Thankfully I’ve found another person who loves Reich’s music to help me out during this entire process. Matt Westwood has agreed to be my recording engineer for this project and I’m very lucky to have him on board. A little about our setup. 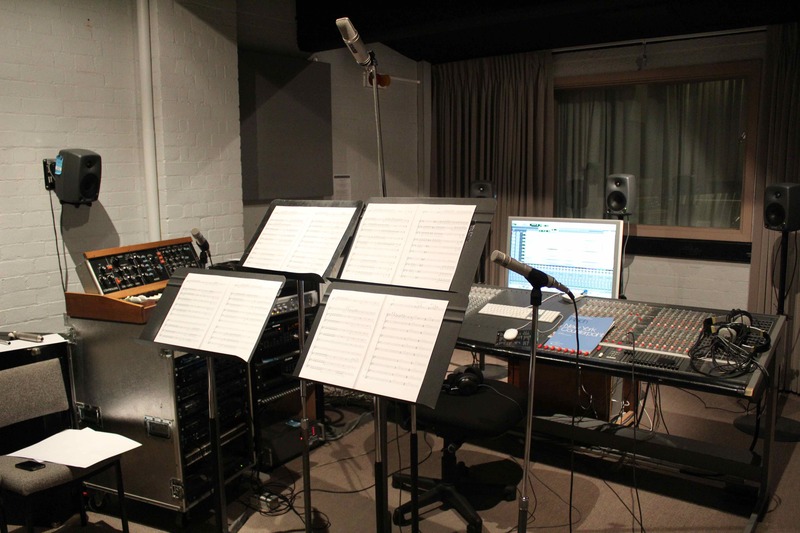 We are recording in the studio at the Melbourne Conservatorium of Music using an iMac and AVID Pro Tools. 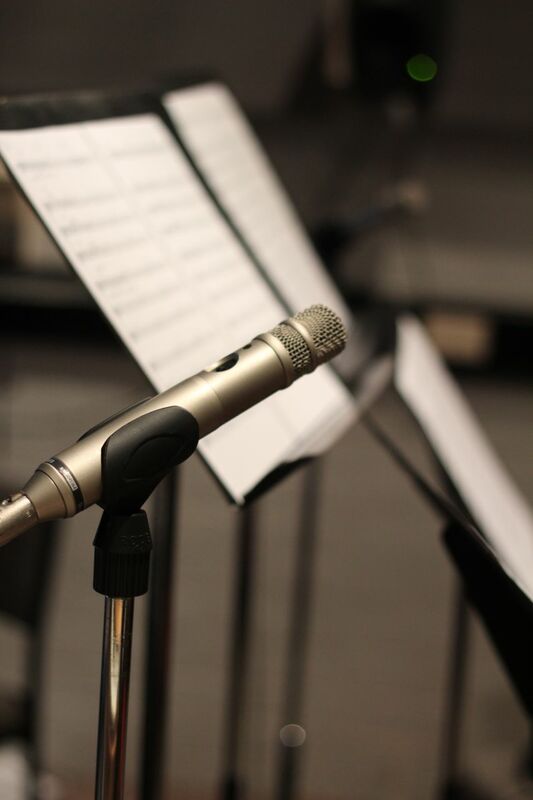 Together we are using 3 microphones for each layer of clarinet; 2 Rode NT3’s at left and right pointing more or less towards the top joint as well as a Rode NT2-A overhead pointing 45 degrees up. I’ve set up 4 music stands, two high, two low, in order to have enough music in front of me for a worthwhile chunk of recording. My music is in score form, not parts, so I have had to make copies of the pages to have them flat; using the bound score alone would be impossible. Using the score also allows me to really understand and plan each take and constantly make sure that the geography of the piece is exactly right down to the last quaver. The floor has been marked with tape in order to position myself exactly between each take. For foldback I’m using my own Bose QC-15 noise cancelling headphones which work fantastically, picking up all the subtleties (and mistakes) very easily. And of course, I’m recording with my Backun ‘MoBa‘ Cocobolo clarinet. There are a few things that I want to get out of this exercise. First and foremost is an excellent quality tape for myself to be able to perform the work anywhere I can. A better understanding of recording techniques and options available for recording acoustic orchestral instruments. Greater technical proficiency on the clarinet by having to nail repeated notes in time and with the exact same articulation as well as truly playing in time. Improve my focus and be able to work through a big task efficiently and without wasting anyones time. A better understanding of the piece, its context and why I enjoy it so much. And there may be a few more yet! We arrived in the studio just before 10.30 and began to set up. Matt already had been experimenting with different mic set ups and wanted to check how the 3 setup would sound. We recorded some test takes, moved things around and came to a position that was comfortable and that sounded good when played back. Having three mics per track gave us our first obstacle to overcome and that was how to deal with an eventual 10 clarinet parts or 30 mic tracks at once. With some clever snooping Matt was able to group the tracks together so that you only had to ‘click’ one as well as have them and the faders colour co ordinated. This helped immensely. At this point we were ready to make a start to I had to go and photocopy my pages to have them all set up at once. For this recording we are using a click track to help out with the timing and it is set at 184 which is the tempo marking in the front of the score. Whilst it seems quick, once you consider how that speed sounds in the middle section of the first movement, it works very well. From there, we started from the beginning with clarinet 1 and didn’t look back. The timing and articulation on day one was difficult, I had to really feel and subdivide the click track to get things to slot in perfectly. We tried to do about 4 fadeins or ‘episodes’ per take sometimes I got through it, and sometimes I didn’t. The ones that didn’t quite work we would retake just that episode in context with the other parts we had done. We manages to lay down the first 4 episodes of cl. 1 – 5 in the first session with varying degrees of success. Emily came in before lunch to take some photos then we had a quick break and listened to what we had so far, it was amazing. The feeling I had finally begun to make this project come to life was excellent and it was sounding pretty awesome for a first try. The odd squeak or undertone was gently replaced if most of the take was good. Throughout the day we stopped for lunch, experimented with recording parts out of context and slotting them in and then finally decided to call it a day at around 6pm with all of about 90 seconds of useable material. It was a very exciting first day and already I’m looking forward to day two. Today was only a short morning session but we were able to really get through quite a bit of music. The teamwork and efficiency between Matt and myself increases two fold per day. We are both slowly learning new Protools shortcuts and giving weird names to different sections of the piece; beginning with assigning fade ins and outs as ‘episodes’ within the ‘series’ of sections in the music. Another two or so minutes of B flat parts was laid down including the first ‘episodes’ of the interlocking rhythmic patterns towards the middle of the first. Just getting a couple of these together was a big step; they are terribly groovy and funky and all the while, crafted complexly with effective yet subtle interactions between all parts. Emily again came in to take some photos of the surroundings and equipment to allow you to see some of the more detailed aspects of this recording process. As it turns out, the recording process is a little more mundane than I would have expected. Not to say the content is mundane but the studio time tends to blur together. Since day two it took another 8 hours to finish all the B flat parts of the first movement. I can already feel just the concentrated work on the repeated quavers has improved my articulation and the instant feedback of the recording with a click track has improved my playing in time. constantly fiddling, finding new shortcuts and making my job so much easier. An excellent tool we’ve utilised is the ability to make marker points during the recording, name them, and then go straight to them when we overdub. I am able to say ‘Clarinet 3 from 49’ and within seconds playback has started and I’m recording new parts. 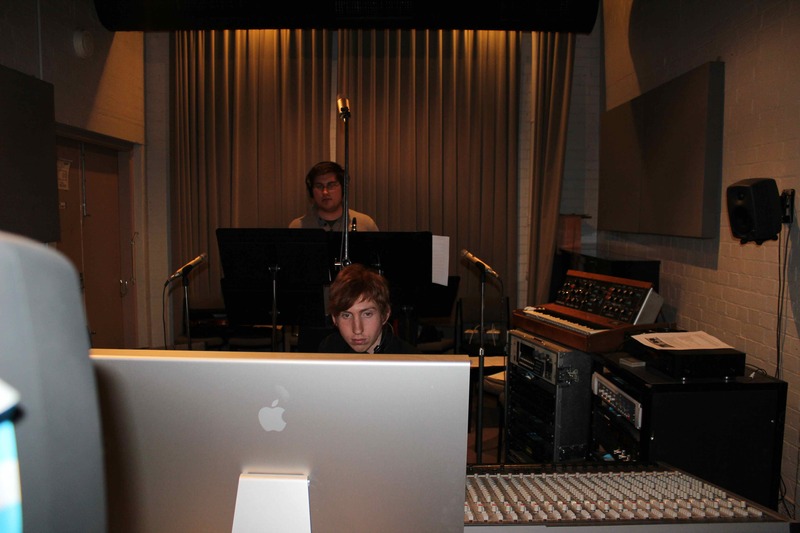 Day 5 is a special day because we started recording the second movement. We made the decision to keep the file going and just transition straight into the second movement in time rather than set it up and record out of the blue. The second movement, being a little less rhythmic and more melodic than the first, shows up intonation problems very clearly. In this session, I’d record Clarinets 1-5 then get to record 6 with 1 and find that I have gone a little sharp over the past 30 mins. Hence, pulling out the tuner and just checking every so often makes all the difference especially when recording a part by itself or with only 1 other reference track. In terms of reference tracks during playback, Ive very rarely used all recorded tracks in the monitor when overdubbing. There are two reasons for this; the rhythmic complexity (of the first movement especially) makes identifying individual parts difficult, the effect is meant to be an interlocking wall of clarinet intricacy so laying down a track displaced by a semiquaver is more than difficult (what does that mean for performance !! ?). Secondly, without panning, which is on the list as a post production tool, having every clarinet coming from directly between your ears is very disconcerting. Eventually, we will spread the sounds around the field just as it would be in a clarinet ensemble. To remedy all of this I will usually choose two or three other parts to record with, this helps keep intonation accurate as well as ‘groove’ so that when we do put things together towards the end of the session, they start to sound amazing !! During the last two days, I grabbed a bass clarinet from the conservatorium and tried to put down some of the bass parts. This proved to be difficult. I have not played a lot of bass clarinet and compared to my B flat playing the bass sounded, quite frankly, disgusting. As we all know there is only one remedy to all this, practise! Ive taken the bass, and practising after my regular B flat session as well as going to clarinet ensemble and playing there. It’s making quite a difference so far and I hope to soon be able to take it back to the studio and record. The second movement is only short, so it shouldn’t take too much time to finish it off (or at least rough it in for fine tuning later) and then we get to move onto the best and most difficult part of New York Counterpoint, the final movement !! The last two weeks have been very busy at uni; performances, rehearsals and a looming AYO audition all contributing to a slight slump in time, but fortunately not in productivity. I should point out here that my ‘days’ refer to sessions of studio time; so whilst we’ve just hit the 7 day mark the project has been on the burner since July 16th, 4 weeks now. As predicted, the second movement is now roughed in, only taking 3 hours. The second movement of NYC is approached very differently than the first; the basic building blocks of the melodic and rhythmic ideas stay almost exactly the same, in each part, throughout the entire movement, constantly building in texture and intensity throughout. An amazing epiphany occurred during the recording session whilst pulling parts out solo; because of the use of rhythmic displacement of the same (if not similar) figuration the parts, in some spaces, all converge on their ‘long note’. Usually its only for a semiquaver or quaver’s length but the effect is astounding. You can actually hear the architecture taking place where a fairly spread figuration to begin with moves in similar yet complementary motion towards a single point before coming back down to the beginning. Whilst beautiful musically, it of course presents challenges for intonation. But here is a very hot tip for anyone else wanting to take on this challenge; close enough can sometimes be good enough. It is annoying to record a good take only to find that upon hearing the tracks back the intonation is not exact, but its actually ok. If the pitch is close, say no more than 10 cents, when put into context the micro tuning disappears and you just get left with beautiful texture to the sound and an in tune note. If you do want to have precision in your own recording, then go for it; its is very achievable but realise that your end result will undoubtedly be a lot more clinical and dry. This technique is not new of course, some of the greatest ‘baroque pop’ albums like Pet Sounds and Sgt. Peppers use layering techniques to great effect. Often a vocal would be recorded then over dubbed with the very same recording but pushed a microsecond out of sync to create micro tunings and add texture to the soundscape. As always, the time flies inside the studio but I’m really enjoying putting this all together. As yet, there is still no bass clarinet laid down after we had to ditch the first recordings. But I’m practising hard and am sorting out a rental of a Buffet Prestige Low C Bass from uni, hopefully I’ll get it soon !! Since writing the last instalment of my New York Counterpoint series we’ve done a lot of work and I’m very proud to say that WE HAVE FINISHED !! The latter part of this year became very busy for all involved and it meant that studio time was limited, both Matt’s and my time was limited as well as preparing for the rest of my recital took up so much time. It was this reason why I began to loose count of the time but I estimate that we’ve completed the tape for all three movements in about 40 hours. Not a bad effort considering that it amounts to over 2 hours of recorded content if unstacked. I’m happy to report that it turned out really well. After another 2 hours of post production (fiddling with the equaliser levels and reverb) we were left with a version of NYC that I would be happy to play to just about any audience. As my recital loomed, I began to focus on learning the solo part. I only had enough time to play the last movement. It was then that I realised just how difficult it was going to be; not because of notes but because of consistency. The solo figurations do not change much through the last movement (until the altissimo G#’s in the last measures!) so making them the same and avoiding squeaks was paramount. Endurance was also a big factor; I had not played a NYC line for more than 90 seconds during recording but here was the entire 3.30 without a break to play. It took a lot of time to get my endurance up to play altissimo, with no breaks constantly (and after 25 minutes of recital already gone). With the extra adrenaline, it was not too much of a problem. Feedback about NYC was very positive with many people commenting on the good sense of groove that it had. The next step will be to premiere the whole piece, next year. After that a reflection is due to be published. In the meantime, if you are a clarinetist and need a summer/winter project. I can not encourage you strongly enough to consider recording your own version of New York Counterpoint.